Hellllloooooooooo everyone! I promise I have not forgotten about any of you! As a matter of fact, I’ve had all of you in the very forefront of my mind all year long!…. Tonight, at 7:00PM MST, I will be making a very HUGE and SPECIAL announcement. I have been collaborating up with an amazing artist, Brittain Scott, and we have spent the past YEAR working on an awesome project – something that has NEVER been done before with pumpkins! It’s a project that we have invested all of our passion, talent, and time on (including MANY sleepless nights) – and we don’t regret one second of it! I know I haven’t been posting much this past year, and this is why! This project really took all year – since last November! I really wanted to create something special for you guys that you will be able to cherish for many years to come! It was definitely a labor of love! Also, that’s not all – stay tuned to find out how YOU can be a part of it this special project forever! Sooooooo many more updates to post – so keep a lookout for those. I’m going to be posting a lot in the next few days, including more time lapse videos, pumpkin carving tips, and even post where you can get my very first 3D pumpkin carving TUTORIAL!!! and lots more stuff from there on out! This is definitely the BIGGEST and most EXCITING year yet! You don’t wanna miss it!!!! 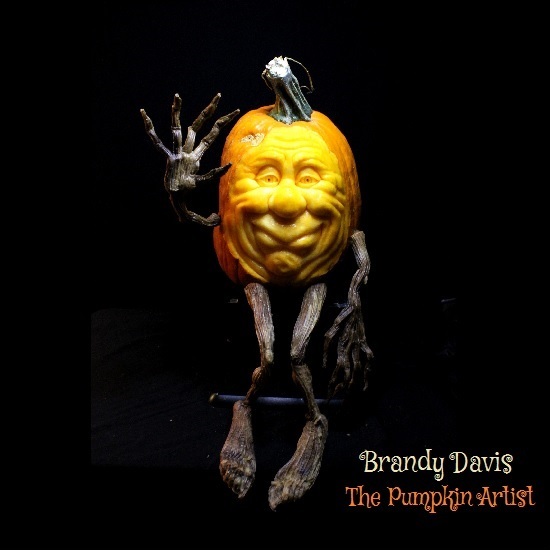 This entry was posted in Pumpkins and tagged 3d pumpkin, 3D pumpkin carving, 3D Pumpkin Carving Tutorial, 3D Pumpkin sculpting, blog, Brandy Davis, Fall, Hallowen, happy halloween, post, pumpkin, special, waving pumpkin. Bookmark the permalink.